Class supplies will differ for each class. Supply lists will generally be sent out by email approximately a week before class. Each student should bring their own machine to class. We also have sewing machines in our classroom available for the student's use. We only have a limited number so we do ask that sewing machines are reserved in advance. There is no additional charge to reserve a sewing machine for class. Each student must bring their own thread. 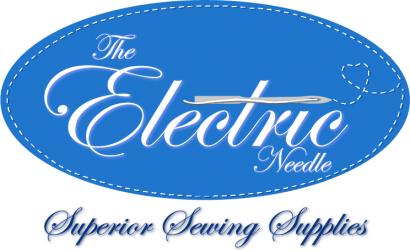 A 15% discount will be applied to all class supplies purchased here at The Electric Needle. We honor the makers who create the patterns that we share with you. Each student will need an original copy of the pattern required for each class. Sharing patterns is considered copyright infringement in our professional environment and we ask you not to put us at risk. Some of our classes will require kits. Kits that are made here are an additional purchase and are eligible for the 15% class supply discount. Some kits are provided by our guest instructors and fees will need to be paid directly to the instructor with cash or check. We ask that beverages be held in a container with a lid, however they cannot contain: cinnamon or pepper. As a general rule, we have a no food policy due to severe allergies of those who work here. If your class has a lunch break, scout local food venues ahead of time. Weather permitting, you are able to pack a lunch and enjoy it outside. With respect to both the instructor and the students time, classes may be cancelled due to low enrollment. Students can request a class to be held but at the rate of a private lesson. Private lessons start at $35/hour. If customers need to cancel their class, we ask to notify us more than seven days in advance. We can then provide a full refund in the form of store credit or a check that you pick up at the shop. Cancellation under seven days will result in no refund. If the student is a no-show, no refund will be given. If a class is cancelled by us (instructor emergency, low enrollment), a full refund in the form of store credit or a check that you pick up at the shop will be given. Cancelled classes due to weather related reasons will be refunded or rescheduled.